Bulgarian bad and restructured loans rose to the record high 24.43% of total lending at the end of April, amounting to BGN 9.74 B, shows central bank data. This marks an increase by BGN 2B in comparison with the same period last year. The Bulgarian banking system is concentrated, with most of the assets owned by large financial institutions from the eurozone. Greek banks control about 28% of banks' total assets in Bulgaria. An International Monetary Fund (IMF) mission, which visited Sofia at the beginning of May, said the banking system remains well capitalized, liquid, profitable, and well supervised. As growth slowed, gross non-performing loans (NPLs) rose in the first quarter of 2012 but their coverage by provisions remains high. According to the IMF reforming the insolvency framework, including limiting backdated insolvencies, would help resolve the backlog of NPLs. Bulgaria recently ranked third in terms of bad loans in an IMF ranking, encompassing all EU member states, almost on a par with Romania, Greece, Ireland, Latvia and Lithuania. Western European countries, including the Czech Republic and Estonia (whose economies the IMF defines as advanced) have single-digit share of nonperforming loans. IMF data shows that lenders in all Central and Eastern European countries have seen their loan quality deteriorate by two-digit percentage. In the advanced economies of Austria, Belgium, Czech Republic, France, Italy and UK, the share of nonperforming loans in 2011 remained relatively unchanged over 2010, IMF data shows. 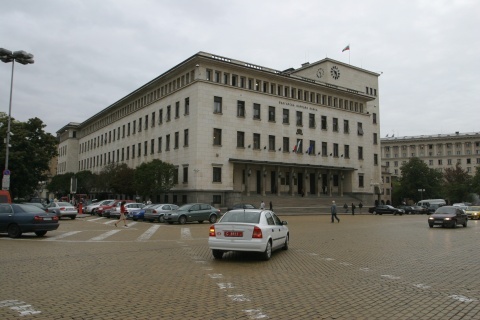 Despite the rising bad loans, however, Bulgaria's banking industry has managed to preserve its stability and boasts capital adequacy ratio of 17.5%, one of the most adequate levels in the European Union. Greek banks hold nearly a 30% of the Bulgarian banking market, a 20% share of the bank loans and one-third of all deposits. Some of the biggest lenders in Bulgaria are managed by Italy's UniCredit, Greece's National Bank of Greece, Hungary's OTP and Austria's Raiffeisen. Other Greek banks present in Bulgaria include EFG Eurobank, Piraeus, Emporiki and Alpha Bank. Experts have warned that Bulgaria, the European Union member boasting one of the the bloc's smallest budget deficit, risks seeing its banks sucked under by the fiscal sins of neighboring Greece. Bulgaria's central bank and finance minister however have repeatedly tried to assuage fears over funds outflow from Greek bank subsidiaries in the country to headquarters in Greece, saying this is part of the free movement of capital.